A disquieting puzzle starring two odd but loving brothers with distinct fixations. Stuart Prebble’s U.S. debut, The Insect Farm, follows the lives of two devoted brothers, Jonathan and Roger. As boys, they were close, but as they enter adulthood they develop separate passions. Jonathan is obsessed with his stunning, brilliant wife, Harriet, and deeply, disturbingly jealous of the attentions she receives from other men. Roger is consumed with his intricate collection of insect tanks and habitats, housed in a garden shed, where he goes to lose himself for hours on end. Roger is mentally handicapped, and his ability in caring for the insect farm is much greater than his abilities in other areas of his life. When their family circumstances change, Jonathan leaves university to care for Roger, putting Harriet at a physical distance since she stays in school. From this point, a series of misfortunes and accidents raises faint questions about the minds of each brother, as they age together in quiet companionship. This unsettling story is told in Jonathan’s retrospective voice, as he looks back on the tragedies that have befallen his family. While each brother is a complex and subtly disconcerting character, this dubious point of view obscures them somewhat, and the reader’s suspicions accumulate. 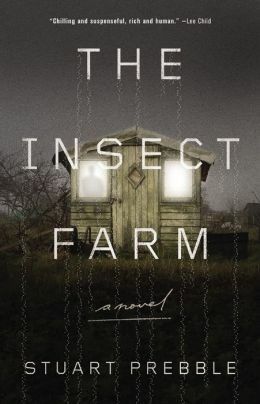 Suspenseful and ominous, The Insect Farm sketches a world of unstable truths, while posing questions about memory, relationships, perception and intuition. Through Jonathan’s shifting narration, Prebble skillfully evokes an increasingly unnerving atmosphere, as it gradually becomes clear how little each brother really understands about the other–and about himself. This review originally ran in the July 21, 2015 issue of Shelf Awareness for Readers. To subscribe, click here, and you’ll receive two issues per week of book reviews and other bookish fun!